Model object for creating tunable one-degree-of-freedom PID controllers. 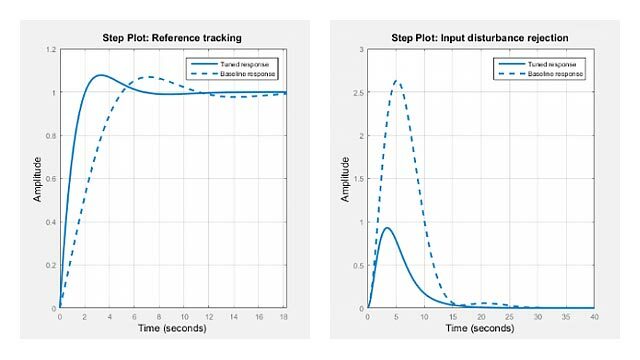 tunablePID lets you parametrize a tunable SISO PID controller for parameter studies or for automatic tuning with tuning commands such as systune, looptune, or the Robust Control Toolbox™ command, hinfstruct. tunablePID is part of the family of parametric Control Design Blocks. Other parametric Control Design Blocks include tunableGain, tunableSS, and tunableTF. with tunable parameters Kp, Ki, Kd, and Tf. The type argument sets the controller type by fixing some of these values to zero (see Input Arguments). where IF(z) and DF(z) are the discrete integrator formulas for the integral and derivative terms, respectively. The values of the IFormula and DFormula properties set the discrete integrator formulas (see Properties). blk = tunablePID(name,sys) uses the dynamic system model, sys, to set the sample time, Ts, and the initial values of the parameters Kp, Ki, Kd, and Tf. Controller type, specified as one of the values in the following table. Specifying a controller type fixes up to three of the PID controller parameters. Sample time, specified as a scalar. Dynamic system model representing a PID controller. Parametrization of the PID gains Kp, Ki, Kd, and filter time constant Tf of the tunable PID controller blk. Value Current value of the parameter. If blk.Kp.Free = 1, then blk.Kp.Value is tunable. If blk.Kp.Free = 0, then blk.Kp.Value is fixed. Minimum value of the parameter. This property places a lower bound on the tuned value of the parameter. For example, setting blk.Kp.Minimum = 0 ensures that Kp remains positive. blk.Tf.Minimum must always be positive. Maximum Maximum value of the parameter. This property places an upper bound on the tuned value of the parameter. For example, setting blk.Tf.Maximum = 100 ensures that the filter time constant does not exceed 100.
blk.Kp, blk.Ki, blk.Kd, and blk.Tf are param.Continuous objects. For general information about the properties of these param.Continuous objects, see the param.Continuous object reference page. Discrete integrator formulas IF(z) and DF(z) for the integral and derivative terms, respectively, specified as one of the values in the following table. Sample time. For continuous-time models, Ts = 0. For discrete-time models, Ts is a positive scalar representing the sampling period. This value is expressed in the unit specified by the TimeUnit property of the model. Unspecified sample time (Ts = -1) is not supported for PID blocks. Changing this property does not discretize or resample the model. Create a tunable PD controller. Then, initialize the parameter values, and fix the filter time constant. and tunable parameters Kp, Kd. Type "pid(blk)" to see the current value and "get(blk)" to see all properties. Create a tunable discrete-time PI controller. Use a pid object to initialize the parameters and other properties. and tunable parameters Kp, Ki. blk takes the value of properties, such as Ts and IFormula, from C.
Create a tunable PID controller, and assign names to the input and output. You can modify the PID structure by fixing or freeing any of the parameters Kp, Ki, Kd, and Tf. For example, blk.Tf.Free = false fixes Tf to its current value. To convert a tunablePID parametric model to a numeric (nontunable) model object, use model commands such as pid, pidstd, tf, or ss. You can also use getValue to obtain the current value of a tunable model. Prior to R2016a, tunablePID was called ltiblock.pid.